SAN DIEGO — If you’ve been wondering how to help hurricane-ravaged sailors, boaters and local residents, consider joining South Coast Yachts’ Southern California’s-spearheaded efforts. The news of Hurricane Irma’s damage in the Caribbean and Florida started bad and grew only worse after Hurricane Maria hit, inflicting a double whammy on some areas, including Puerto Rico and the Virgin Islands. Three hurricanes decimating the region plus destructive earthquakes in neighboring Mexico have many boaters looking for new ways to assist survivors. 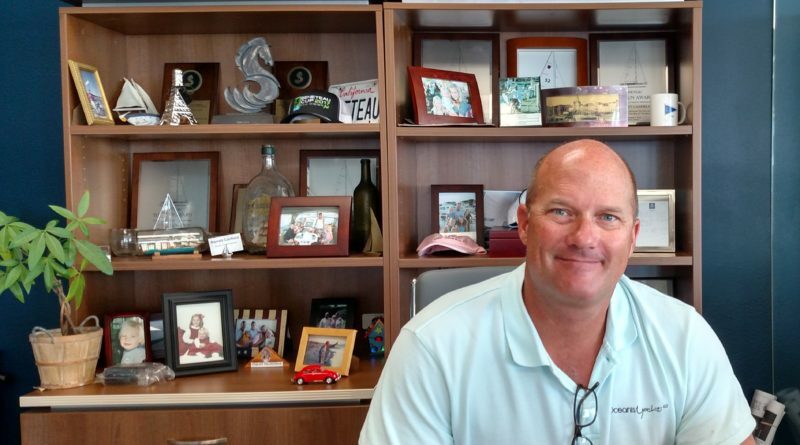 For San Diego-based South Coast Yachts President Barrett Canfield, news reports brought back too-vivid memories of life in the U.S. Virgin Islands after Hurricane Marilyn struck in 1995. Just shy of Category 3-strength winds, Marilyn destroyed or damaged 80 percent of the homes in St. Thomas and left 10,000 island residents homeless, along with thousands more on nearby St. John and St. Croix. Canfield’s St. Thomas apartment survived, but his girlfriend – now wife – Liz’s apartment did not. She, along with several other newly homeless friends, moved in with him. They went without power for 45 days, while he, then base manager for a charter company, and colleagues worked to rebuild their sailing fleets. For Harvey, Irma and Maria, as with most major storms, news on hurricane damage to boats and marinas lagged about a week behind general reports, but Canfield already had reports about the region’s catastrophic destruction. Canfield, disturbed by rumors of price gouging and profiteering targeting boaters trying to save, salvage or repair their boats, sprang into action. He rallied the sailing community, contacting fellow Bénéteau dealers and sailing colleagues asking if they had any spare parts to donate to help out hurricane-affected fellow sailors and charter operators get back on their feet. Canfield has been delighted with the response, as current and former customers have also stepped forward, offering donations of usable equipment. “After my experience in the Virgin Islands, if I can do something to help, I’m going to try,” he explained. He began with a list of South Coast’s available parts, including several masts and sails lingering from mistaken orders, plus extra anchors, blocks and rigging. He asked colleagues in related businesses and potential donors to email him descriptions of any spare parts they were willing to contribute, including name, brand, size (if appropriate) and geographic location. “The goal is to give the parts to people in need, to help them restore their boats and their charter operations,” Canfield explained. South Carolina-based Bénéteau America is helping compile the list and match those in need with available parts. Thus far, he reported, they’ve matched one sailor with a 48-foot mast to restore his boat and are handling several other requests. A former San Diego customer recently relocated to St. Thomas and is helping spread the word about the part-matching program among hurricane-affected boaters. To offer donations, please email Canfield at Barrett@scyachts.com or contact Bénéteau America through their website at bénéteau.com. Taking another tack, South Coast yacht broker Leanne McNally, a frequent BVI visitor eager to help out the severely hit British Virgin Islands, has organized a fundraiser through the San Diego Yacht Club to benefit devastated BVI residents. She’ll channel the funds raised — her goal is $10,000 or more — through Sir Richard Branson’s Virgin Unite (a registered U.S. nonprofit organization), which they selected because Branson covers all administrative costs. Information about and tickets for the Oct. 6 SDYC fundraiser are at sdyc.org/calendar/event/bvi-fundraiser. They’ll continue the campaign for BVI Relief through the end of October. Have you come up with an innovative way to help disaster survivors recover? If so, please contact editor@thelog.com.